Wexford Skin Clinic | Why Do I Have To Wear Sun Protective Factor (SPF)? - Wexford Skin ClinicWhy Do I Have To Wear Sun Protective Factor (SPF)? Why should I wear Sun Protective Factor (SPF)? I write this from the coziness of the clinic while the rain lashes against the window…. Summer in Ireland… But at least the temperatures have risen! The picture attached to this blog is fairly shocking! 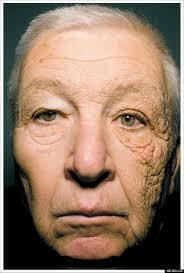 This man is a truck driver and as you can see, from sitting in his truck, with the sun shining in, one side of his face looks 30 years older than the other side… This is how ageing the sun is to our skin…so no I’m not lecturing you when I say WEAR SUNSCREEN!!! Many people are aware that it’s important to apply an SPF daily all year round, even in dark, dreary January…but why? There’s no heat so why would we need to protect our skin from burning?!! Did you know that there are different UV rays from the sun? UVC is stopped by the ozone layer, so we need not worry about him for the time being! UVB is the one we are all aware of as it’s present when there is heat and we are at risk of sunburn. Obviously this ray will damage our skin with regards to ageing but also poses a skin cancer risk, hence why the Irish Cancer Society advises us to cover up and wear sunscreen from April to September. UVA is the sneaky one…he has no warning signs like heat but he is present all year round as strong in January as in July! UVA penetrates the deepest, into our dermis, where we produce collagen & elastin…if he gets in he destroys these precious proteins, hence why the sun ages us. As I say to my clients, once there’s the daylight, there’s sunlight AKA UVA…so the first step in anti-ageing is protecting our skin every single day (even if you are just popping out to the washing line) with a broad-spectrum SPF which protects against both UVA and UVB. Starting from within, is Advanced Nutrition Programmes, Skin Defender. Packed full of anti-oxidants such as Vitamin E, Beta Carotene, Vitamin C & Green Tea which protect skin from sun damage plus Beta Glucans which makes the skin less likely to get burned, this supplement is a must for anybody who spends time outdoors and is also excellent to take 2 weeks prior to holidays to prevent skin from burning in the first few days in the sun. Personally I think anyone concerned with looking their best should take Skin Defender from April to September. Next up, is Image Prevention + range of broad-spectrum SPFs. While there are many great skincare ranges on the market, Image is the clear winner with these moisturisers. You know how hard it can be to find a nice, non-greasy SPF right?? My clients LOVE the Prevention + range! There are 5 products within the line, Hydrating 30, Matte 32, Tinted 30, Ultimate 50 and Sheer Spray 45 so something for everyone. They contain Zinc oxide and are enriched with anti-oxidants, vitamins and green tea as anti-inflammatory agents. Paraben-free. Lastly we have my new addiction, which is Jane Iredale, the Skincare Make-up. This is the bees knees, cats pyjamas, (I won’t use the bold one relating to dogs) and the Rolls Royce of make-up…Nothing comes close. This make-up actually treats your skin!! Their foundations, which can be reapplied during the day without looking caked on are foundation, powder, concealer and SPF in ONE PRODUCT!! They are quick and simple to apply, oil-free, no talcs, fillers or sensitisers….the list goes on and on…. The Pure-Pressed Base, Amazing Base, Glow Time and Dream Tint are available in shades to suit all skin tones, just call me to make an appointment to colour match for your skin tone and preference! Lastly we have the Jane Iredale, Powder-Me SPF Dry Sunscreen…and what a genius product this!! You’re sitting outside in the sunshine, with the gals, sipping a large glass of Spritzer (imagination may be needed here on this lashing wet day!!) , your make-up is perfect and the last thing you’re going to be doing is putting SPF moisturiser over your flawless make-up…just pop this baby out of your handbag, powder over your face and Bob’s your uncle! With an SPF of 30, you’ll be the envy of all your pals with this product! Available in 3 shades, translucent, golden and tanned…plus can be used as a dry shampoo…what’s not to adore with this multi-purpose product! If you would like to enquire about any of the products featured, please do not hesitate to call me and if not….whatever else you do….WEAR SUNSCREENS! !